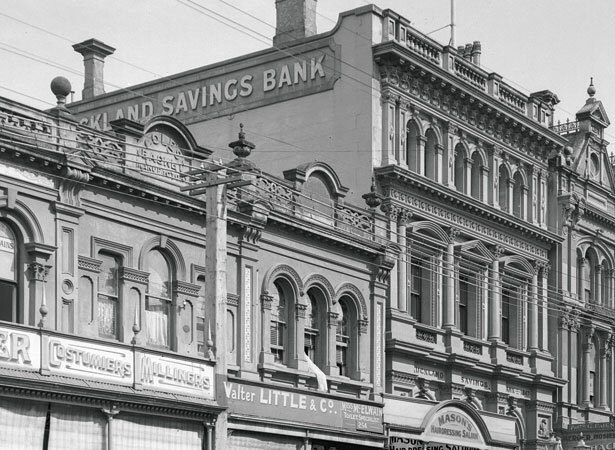 The New Zealand Banking Company, Auckland’s first bank, had been wound up two years earlier. The new bank was launched at a meeting of prominent gentlemen. Its formation was encouraged by Governor George Grey, who hoped it would attract business from working men of both races and become ‘an immediate and active agent in civilization’. Māori in particular were, it was claimed, ‘becoming awake to the pleasure of simple accumulation, to the advantage of putting their money out of their own power’, at least temporarily. The bank opened to received deposits for an hour each Saturday evening in the new brick store on Queen St of John Montefiore, one of its 17 founding trustees. When Matthew Fleming made the first deposit of £10 two weeks later, it was secured in Montefiore’s fireproof safe. By the end of the year, 14 Pākehā and seven Māori had opened accounts with a total balance of £166 4s. From May 1848, these received 5 per cent interest. ASB Bank has been fully owned by the Commonwealth Bank of Australia since 2000. We have 2 biographies, 1 article, related to Auckland Savings Bank opens for business .